In Brazil, Federal Law No. 11,101/2005 (the Bankruptcy Law) came into force on 9 June 2005, bringing significant changes to the legal treatment of Brazilian companies in financial distress. The main purpose of the Bankruptcy Law is to increase the chances of economically viable companies overcoming their crisis, preserving their activities and maintaining the productive source, employment and business in general. fifth period: infrastructure, construction, engineering and communication companies, such as OAS, Galvão Engenharia, Schahin, Sete Brasil, Oi, Viver, PDG, Abengoa, UTC and Aeroportos Brasil Viracopos. A criminal investigation involving corruption cases mainly in the construction sector, known as Operation Car Wash, which the Federal Police of Brazil has been carrying out since March 2014, has driven the country to an unprecedented political and economic crisis, leading construction and infrastructure companies, whether involved or not in the investigation, to file judicial reorganisation and extrajudicial requests. As a consequence of such crisis, according to Serasa Experian,2 2016 had a record number of judicial reorganisation requests since the Bankruptcy Law came into effect, with an increase of 44.8 per cent compared with 2015. In 2017, however, the number of reorganisation proceedings in Brazil fell by more than 20 per cent compared with 2016. In the first quarter of 2018, the number of requests for judicial reorganisation started to increase again, reaching 30.15 per cent compared with the first quarter of 2017. The Bankruptcy Law is applicable to individual entrepreneurs and companies in general, but not to state-owned companies, mixed-capital companies, financial institutions, insurance companies and some other entities expressly excluded by the law, which are subject to other specific insolvency proceedings. The Bankruptcy Law establishes three insolvency proceedings, as follows: (1) judicial reorganisation; (2) extrajudicial reorganisation; and (3) forced liquidation. 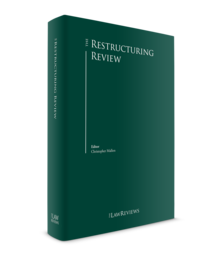 The mechanisms of judicial reorganisation and extrajudicial reorganisation aim to restructure a viable company and its debts in order to preserve its activities. The forced liquidation proceeding shall apply when the company is no longer viable. In this case, the debtor is removed from the company's management and activities. The existing assets are seized, appraised and sold by a judicial administrator appointed by the court, who will use the proceeds to pay the company's debts. A judicial reorganisation proceeding begins with the filing of a petition with the court, and may only be voluntary, that is, creditors cannot request a debtor's judicial reorganisation. In order to file the request the debtor cannot: (1) be bankrupt; (2) have had another judicial reorganisation request granted within the past five years; and (3) have been convicted of a bankruptcy crime. The judicial reorganisation binds all the existing credits against the debtor at the time of the request (pre-petition claims), even those undetermined or not yet matured at the time of the filing, except for credits with fiduciary collateral, based on advance of foreign exchange currency agreement and tax claims. If all requirements for the judicial reorganisation are met (e.g., delivering the lists of creditors and of all lawsuits filed against the debtor, etc. ), the court will grant the request, appoint a judicial administrator3 and order the publication of the list of creditors. This decision triggers a stay period of 180 days, during which enforcement actions filed against the debtor will remain suspended. Brazilian courts have been admitting the extension of the stay period in cases where the debtor has not delayed the proceeding and needs more time to negotiate with the creditors. The debtor remains in possession of the assets and management of its activities. After the filing, the debtor cannot sell its fixed assets without prior authorisation of the court or approval of the plan at the creditors' meeting foreseeing the sale of the assets. The role of the judicial administrator is limited to the supervision of the proceeding, verification of claims and organisation of the creditors' meeting. The debtor5 must submit its reorganisation plan with the court within 60 days of the date of publication of the granting decision in the Official Gazette, under the penalty of a bankruptcy decree. The reorganisation plan must set forth in detail: (1) the reorganisation measures to be undertaken, such as provision of restructuring of the debt, change of control, replacement of the management, increase of the capital, merger, spin-off and incorporation, new financing (DIP finance) and partial sale of assets, among others; (2) evidence of the economic viability of the plan; and (3) an economic-financial report and an appraisal report of the assets of the debtor, prepared by a qualified professional or by a specialist company. The plan cannot provide that overdue labour credits and credits deriving from accidents at work will be paid in a term longer than one year from the ratification of the plan approved by the court. After the publication of a notice informing the creditors about the plan, creditors may file objections against the plan within 30 days. If there is no objection, which is not usual, the plan will be automatically approved. However, in case of an objection by any creditor, the court must convene a creditors' meeting to discuss and vote the plan. The debtor may modify or amend the plan even during the creditors' meeting. There are four classes of creditor in judicial reorganisation proceedings for voting at the creditors' meeting: (1) class I – labour creditors; (2) class II – secured creditors; (3) class III – unsecured creditors; and (4) class IV – micro and small businesses. As a general rule, the four classes of creditors must approve the plan by the majority of the votes of creditors attending the meeting: labour and microenterprises or small businesses must approve the plan on a headcount basis, while secured and unsecured creditors must approve it on a headcount and amount-of-claims basis. The shareholders, affiliated companies, controllers, companies under control of the debtor, companies holding more than 10 per cent of the debtor's shares or companies in which the debtor holds more than 10 per cent cannot vote at the creditors' meeting. If the plan is approved by (1) two out of the four classes of creditors; (2) at least 50 per cent of the creditors attending the meeting, by amount of claims; and (3) a third of the creditors in the dissenting class, the court may approve the plan by the 'cramdown' mechanism. In case of rejection of the plan, the court must decree the debtor's forced liquidation. If approved, the court will analyse the legality of the plan and, afterwards, ratify it, causing the novation of all the credits subject to the judicial reorganisation. The reorganisation plan may provide for a judicial sale of branches or individual going concerns belonging to the debtor. The judicial sale may take the form of an auction and be effected through proposals submitted in sealed envelopes, or be a combination of the former two options. Once the judicial sale is effected, the relevant branch or going concern will, in principle, be free and clear of any liens and encumbrances, and the purchaser will not succeed the debtor with respect to any indebtedness. After the ratification of the approved plan by court, the debtor must remain under judicial reorganisation for a period of two years under the supervision of the judicial administrator and the court. In case of failure by the debtor to comply with the provisions of the plan during this period, the court may decree the debtor's forced liquidation. After such period, the judicial reorganisation proceeding is terminated, and in case of default by the debtor, creditors may (1) request the debtor's forced liquidation; or (2) file an enforcement proceeding against the debtor seeking the payment pursuant to the conditions of the plan. Extrajudicial reorganisation allows the debtor to restructure its debts with specific groups of creditors, for example, only financial institutions or secured creditors. In the extrajudicial reorganisation proceeding, the debtor negotiates the plan with its creditors (pre-package restructuring) and may request the ratification of the plan by the court. Extrajudicial reorganisation is only applicable to secured, unsecured, micro, and small businesses. Labour and tax claims, credits with fiduciary collateral or those arising from advance on exchange contracts cannot be affected by the extrajudicial reorganisation process. In extrajudicial reorganisation, no judicial administrator is appointed. If the plan is not ratified by the court, the forced liquidation will not be decreed and the debtor may negotiate a new plan or file a request for judicial reorganisation. In case of failure by the debtor to comply with the conditions of the ratified plan, creditors may file an enforcement procedure against the debtor seeking the payment pursuant to the conditions of the plan. The forced liquidation proceeding may be voluntary, filed by the company itself, or involuntary, filed by its creditors. Creditors may request a company's forced liquidation when: (1) the debtor failed to pay a due debt that exceeds 40 minimum wages;7 (2) the debtor failed, during the legal period, to pay the debt or to appoint assets for seizure, in a foreclosure proceeding; and (3) the debtor practised acts such as fraud against the creditors, fraudulent payments or failure to comply with its obligations pursuant to its reorganisation plan. As a response to the request filed by a creditor, the debtor may: (1) pay the debt, causing the termination of the process; (2) file a defence and post a bond with the Bankruptcy Court to avoid the liquidation decree. In case of rejection of the defence, the bond will be released to the creditor; (3) only file a defence; or (4) request its judicial reorganisation. subordinated credits (as considered by law or agreement, and shareholders' and certain managers' credits). In addition, if the debtor is in possession of assets (including money) that belong to third parties at the time of the forced liquidation decree by the court (by a leasing or fiduciary collateral sale agreement or advance of foreign exchange currency agreement, for example), rightful owners may request restitution of their assets before the payment of any creditor. In situations where assets no longer exist, the owner will be entitled to receive an equivalent amount in cash. The same will occur when a bank has disbursed funds to the debtor pursuant to an advance of foreign exchange agreement. In such cases, any restitution in cash will have priority and will only be subject to the previous payment of labour claims that have matured three months before the declaration of forced liquidation, up to a limit of five times the prevailing minimum wage per employee. After the forced liquidation is decreed, the debtor company will be liquidated so that its assets can be seized and sold by the judicial administrator, and the amount obtained will pay the creditors. Only after the extinguishment of all obligations may the shareholders request the rehabilitation of the company, in order to explore its activity once again. All the debtor company's obligations will be considered extinguished if (1) it is able to pay all of its debts; (2) it is able to pay up to 50 per cent of its unsecured debts; (3) after five years of the end of the proceeding if there was no conviction for bankruptcy crime; or (4) after 10 years of the end of the proceeding if there was a conviction for a bankruptcy crime. The forced liquidation proceeding is a case of total judicial dissolution of the company. If after the sale of all assets and the payment of creditors there is any amount left, which is very unlikely to occur, this amount will be given to the shareholders in proportion to their participation in the company's equity. In Brazil, there are several types of security over assets. The main ones are: mortgage (over real estate assets and vessels), pledge (on movable assets, including receivables) and fiduciary collateral of assets (real estate and movable assets). Credits guaranteed with mortgage and pledge are subject to judicial reorganisation and forced liquidation proceedings, whereas credits guaranteed with fiduciary collateral of assets are not subject to judicial reorganisation or forced liquidation. Pre-petition claims secured by mortgage and pledge on the debtor's assets8 will be classified as secured credits. Security granted by third parties that are not under judicial reorganisation will be classified as unsecured credits. Pursuant to the Bankruptcy Law, the relevant secured creditor must give prior approval of any disposal of collateral by the debtor in the judicial reorganisation plan. The debtor must pay each category of creditor according to the reorganisation plan. Therefore, the secured creditors subject to the proceeding cannot seek enforcement or remedies for protection of their collateral, other than negotiating the payment of the respective credit under the reorganisation plan. A creditor holding fiduciary collateral may enforce its guarantees after or during the judicial reorganisation request in the event of default, as they are not subject to the judicial reorganisation. If the asset granted as a collateral is essential to the debtor, the creditor may only remove the asset from the debtor's possession after the end of the stay period. In forced liquidation proceedings, the respective creditor may request the restitution of its assets to the judicial administrator before the payment of any creditor. For credits secured by mortgage or pledge that are not subject to the proceeding, the creditor may, if all requirements are fulfilled, file an enforcement proceeding against the debtor company. In such an enforcement proceeding, the creditor is able to seize and attach the guarantees granted by the debtor company and other assets, up to the full amount of the debt if necessary. The judicial enforcement proceeding may take a couple of years to be concluded, especially if there is a judicial reorganisation in course, if enough assets are duly seized, attached and sold. If not, and the creditor has difficulty finding assets of the debtor company, it may take several years. For enforcement of fiduciary transfer of real estate assets, when the debtor is not under forced liquidation, the mechanism applicable in case of default is provided by Law 9,514/97. The real estate registry office shall notify the debtor, upon request of the creditor, to pay the total debt and solve the arrears within 15 days. The debtor shall make the payment to the real estate registry office, to be delivered within three days to the creditor, discounting the costs for collection and summons. If the debtor fails to make the payment, the real estate registry office must certify this fact and register the transfer of the ownership to the creditor, upon the payment of the transfer tax. The creditor must provide a public auction to sell the property within 30 days. In a first auction, the minimum price of the property must correspond to an amount equal to or higher than the value of the property stated by the parties in the respective instrument that constituted the guarantee. If the first auction is not successful, a second auction must take place within 15 days. In the second auction, the minimum price of the property must correspond to an amount equal to or higher than the amount of the debt and related charges and expenses. If the sale is successful, the resulting proceeds will be used to pay the debt and expenses related to the auction, and the creditor will pay the possible balance to the debtor. If the property is not sold in the second auction, the claim or credit will be extinguished and the ownership of the real estate asset, which had been transferred to the creditor, will remain with it. The fiduciary collateral of movable assets by financial companies is governed by Law 911/69. In this case, the creditor may file a lawsuit9 seeking the possession of the asset. For operations of fiduciary transfer of movable assets by non-financial companies, the applicable law is the Brazilian Civil Code. In such cases, if the debtor fails to make the payment, the creditor may carry out the judicial or extrajudicial sale of the assets to third parties, use the sum obtained to pay the debt plus charges and expenses, and deliver the balance to the debtor, if any. The Civil Code provides that, if the sum obtained by the selling of the assets is not enough to pay the debt, the debtor remains obligated to pay the outstanding amount. duty to inform (e.g., publish annual balance sheets) and keep confidentiality. If the company's shareholders or managers fail to comply with the fiduciary duties mentioned above, the court may deem them liable for certain obligations or acts. In the forced liquidation proceeding, the Bankruptcy Court may investigate and determine the shareholders' and managers' liability if it verifies that they performed any act or omission that contravenes Brazilian law – for example, corporate laws, tax laws and labour laws – regardless of the collection of the assets and impossibility to pay all the creditors of the company. The Bankruptcy Law predicts that in those cases, a responsibility lawsuit will begin in the Bankruptcy Court, and in this lawsuit, the defendant's assets can be blocked in compatible amount to the damage caused, until the final judgment. The term for the filing of a responsibility lawsuit finishes two years after the decision that ends the forced liquidation proceeding. In addition, according to the Civil Code, the court may disregard the company's corporate veil if it considers that there was an abuse of its legal personality (in case of equity confusion and misuse of purpose). In this case, the shareholders would be considered liable for all of the company's debts. The possibility of piercing the corporate veil was created as an exception to the limited liability of the shareholders, and once decreed by the judge, the shareholders shall respond with their own assets for a specific obligation. This possibility is foreseen in the Civil Code, and can also be applied to a company that was declared bankrupt. The essential requirements are: abuse of the corporate veil, with deviation of the company's purpose or estate confusion between company and shareholders. In each concrete case, the judge will analyse the presence of such requirements – these requirements are more objective than just 'fraud' or 'abuse', but the decision by the court may remain very subjective. Finally, if the public prosecutor understands that the shareholders, officers or directors committed a bankruptcy crime, he or she may file a criminal action. The Bankruptcy Law sets out several criminal offences related to bankruptcy, whose penalties can vary from one to six years of imprisonment, plus a fine. The Bankruptcy Law only provides for clawback provisions in forced liquidation proceedings, that is, there is no clawback period in the judicial or extrajudicial reorganisation regimes. The Bankruptcy Law establishes that the forced liquidation of a company could potentially affect, in certain circumstances, sales, acquisitions or any transaction carried out during the legal term of liquidation. The legal term of liquidation may be applied retroactively for a period of up to 90 days, to be fixed at the court's discretion, starting from: (1) the bankruptcy decree; (2) the filing of the judicial reorganisation request, in cases where the judicial reorganisation is converted into bankruptcy; or (3) the first protest for non-payment of a credit instrument or debt security issued by the debtor. During the retroactive period, the court will declare ineffective vis-à-vis the bankrupt estate: (1) prepayment of a debt (not yet due) during the legal term of liquidation; (2) payment of past due debts during the legal term of liquidation by means other than those provided for in the relevant credit agreements; (3) creation of an in rem collateral within the legal term of liquidation, to secure an existing debt; and (4) sale or transfer of a commercial establishment without the prior consent of the creditors or payment of creditors. Article 130 of the Bankruptcy Law provides that any fraudulent act (i.e., performed by the parties with the intention to harm other creditors) may be declared null and void by the court, and, therefore, may be subject to clawback. Federal Law No. 13,043/2014 provided for a specific federal tax relief system for companies under judicial reorganisation proceedings. To be able to benefit from this relief system, some specific requirements must be fulfilled (such as not judicially challenging the tax debt to be renegotiated), and if the request is approved by the federal tax authorities, the debtor company will be able to pay its tax debts in up to 84 instalments. The first 12 instalments must correspond to 0.666 per cent of the debt; from the 13th to the 24th, the instalments must correspond to 1 per cent of the debt; from the 25th to the 83rd instalments, each shall correspond to 1.333 per cent of the debt; and the last instalment must correspond to the remaining amount of the debt. In addition, the debtor company can only request this benefit once in each judicial reorganisation proceeding, and it must refer to all of its federal tax debts. Federal Law No. 12,767/2012 determined that the proceedings of judicial and extrajudicial reorganisation are not applicable to public electricity service concessionaires. As mentioned above, Operation Car Wash, among other factors, led Brazil to a severe political and economic crisis, and several important infrastructure companies in Brazil requesting judicial reorganisation proceedings. The most significant restructuring in 2016–2017 was the Oi judicial reorganisation proceeding, in which the debts exceeded 65 billion reais. It is so far the largest reorganisation in Latin American history and will most likely be considered one of the most innovative judicial reorganisations, since it set new parameters and standards for such proceedings in Brazil – including changes in case law, that has evolved in the past years. This reorganisation also developed the proceeding itself, since adjustments have been made to adapt it to such a large restructuring. Currently, the judicial reorganisation of UTC Group, an economic group in the construction sector that was investigated in Operation Car Wash is a relevant case, and its outcome will be relevant to analyse whether or not companies involved in the investigation will be able to overcome their crises in a hostile environment of negotiations with creditors. A very recent request for judicial reorganisation was filed by the concessionaire of Viracopos Airport, also involved in Operation Car Wash. The particularity of this case is the discussion involving the possibility of the judicial reorganisation court suspending the administrative proceeding filed by the ANAC (the National Civil Aviation Agency) to declare the forfeiture of the concession. Brazilian Law is silent on rules regarding cross-border insolvency proceedings, and recent court precedents show that discussions in respect to cross-border insolvency are still to evolve in Brazil. Thus, considering that each company of a transnational group has a proper legal entity, the law of the respective jurisdiction where the company is located must, as a rule, be followed. As such, Brazilian bankruptcy courts have exclusive jurisdiction to decide on matters related to the bankruptcy of Brazilian companies but, in principle, they do not have jurisdiction to decide on matters involving foreign companies. However, there are precedents from Brazilian courts admitting the inclusion of foreign entities in judicial reorganisation cases in Brazil,10 provided that certain requirements are met. In accordance with such precedents, the foreign entities must be constituted only to be mere financial vehicles of the Brazilian entities, in order to receive investments and proceeds from other countries, and not be autonomous companies with their proper activities, employees, cash flow and receivables. In the cases mentioned above, Brazilian courts have considered that Brazil was the main centre of interests of the group. In accordance with the Bankruptcy Law, the debtor shall file the request for judicial reorganisation at the jurisdiction of the main centre of interests, meaning the place where the company makes its decisions, regardless if it is the head office or an affiliate of the company. Consequently, courts have been applying such provision to cases involving a foreign company of the group concerned. In addition, there are legal provisions in Brazil that allow recognition and enforcement of foreign decisions (interlocutory or final) by the Superior Court of Justice, once legal requirements are met. The decision must be in compliance with the Brazilian public policy, sovereignty and principles of morality, such as human dignity, and some formalities must be observed, such as sworn translation of the decision and notarisation or apostillation of signatures. After years of application in different and relevant cases, recent precedents reveal that there are relevant issues that are not addressed by the Bankruptcy Law, such as cross-border insolvency, judicial reorganisation of economic groups and substantive consolidation. In 2016, the Brazilian Ministry of Finance formed a group to draft a bill modifying the Bankruptcy Law. The Ministry of Finance sent the bill to the presidency. After some additional modifications, President Michel Temer sent the bill to the Congress for discussion and voting. The current version of the bill addresses, among other issues: (1) cross-border insolvency, applying the rules of UNCITRAL; (2) judicial reorganisation of economic groups, specifying rules for application of substantive consolidation; (3) incentives to DIP finance, clarifying that the creditor of the DIP must receive its payments with total preference; (4) more celerity to all insolvency proceedings; and (5) more power to the creditors, including the possibility for them to submit an alternative plan. Considering the above, modifications to the Bankruptcy Law are expected in 2018. 1 Flavia Cristina Moreira de Campos Andrade is a partner and Liv Machado is an associate at TozziniFreire Advogados. 2 A Brazilian company that analyses information and data in order to base decisions related to credit. 3 That may be a specialist company, a lawyer, a business management, an accountant or an economist. 4 The parties may file an appeal to the state court within 15 days of the publication of the decision. 5 Creditors cannot submit a plan. 6 Judicial reorganisation of Triunfo, Colombo and Enseada. 7 A minimum wage in Brazil in January 2018 corresponded to 954 reais, i.e., 40 minimum wages would correspond to 38,160 reais. 8 Provided that the respective instruments are perfected. 9 Ação de busca e apreensão. 10 OGX, Sete Brasil, Schahin Group and Oi Group cases.